When teens and parents have ongoing conversations about alcohol and drug use, the likelihood that teens will become involved with substances goes down by as much as 50 percent. Don't know how to start those conversations? We have tons of resources for you! Go to drugfreegeneration.org/parent-resources. 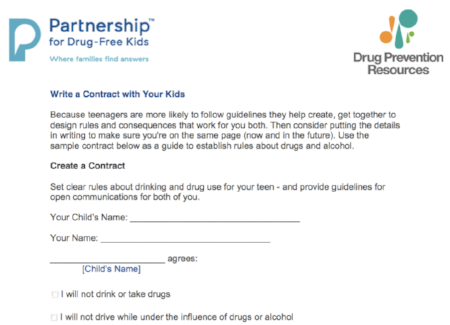 One of the best resources we offer is a contract you and your teens can sign that spells out what you each agree to when it comes to substance use. This is a great tool especially during this Red Ribbon Week when the national and local focus is on how to prevent alcohol and drug use. Check out the contract here. Let us know how you're using the contract--or any of our resources--in the comments section. We'd love to hear from you!